How do I create a dark and edgy interior? An abundance of time and interest is placed on how to create a light and bright interior, but what if that is simply not your cup of tea? Today on homify we will be looking at a range of designs that have baulked the common trend—ones that have infused a home with rich, edgy, and intriguing shades, instead of neutral and muted hues. A dark interior does not necessarily mean a room devoid of natural light, or a space without brightness; a domestic interior can evoke a moody and mysterious ambience whilst remaining warm, comfortable, and well-lit. When creating a dark interior, the key is to balance the deep and rich tones with contrasting elements of white and strong colour. Think obsidian, ultramarine and black, combined with metallic tones, neon hues, and bright statement lights. If white, neutral or placid interior colour schemes put you to sleep, take a look at the following examples below, and begin planning your transition to the dark side. Moreover, use these examples to inspire your own creatively eclectic interior design, which will inspire, enthral and enchant. Who doesn’t love a bathroom where you can slip into a hot bath, surrounded by clean fresh linear architecture, stylish décor, and a sense of relaxing opulence and mystery? This space by Lisa Melvin Design is all that and more. Brimming with stylish features such as a huge freestanding bath, heated towel rail, and plenty of space to enjoy oneself, this room oozes elegance. 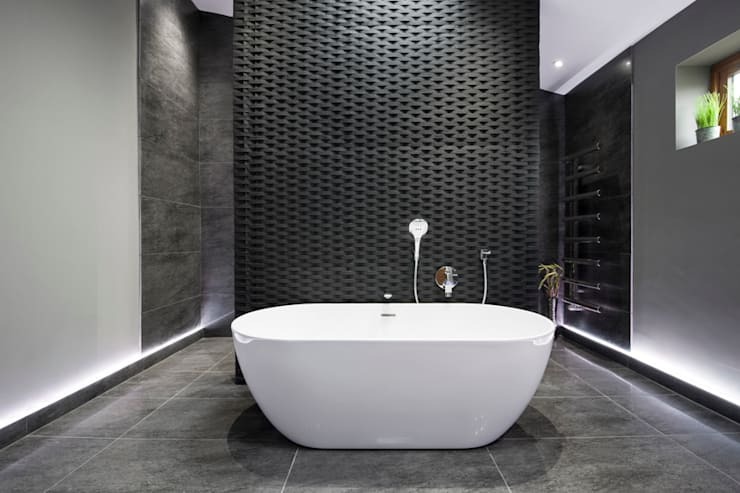 The darker colour scheme is balanced with a contrasting white tub, which works wonderfully against the textured steel-esque freestanding wall. 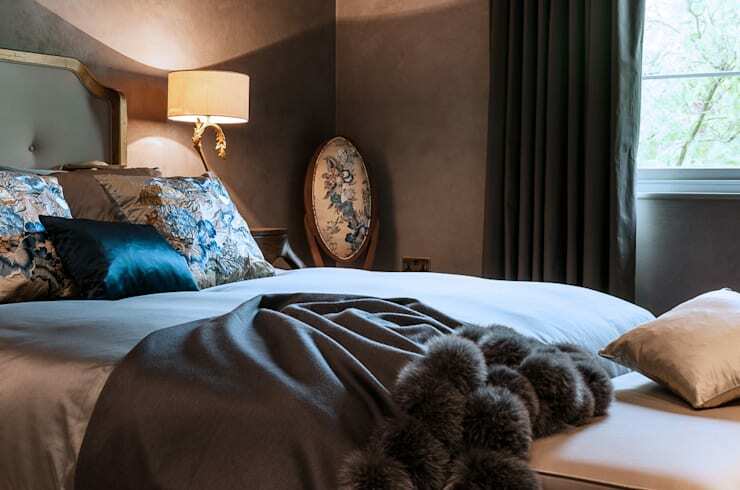 A dark interior doesn’t have to mean a theme of black, grey, charcoal and other shadowy hues—this bedroom incorporates a deeper darkish colour scheme which creates a sense of richness and sumptuousness. Think luxurious textures in purples, deep turquoises, and French greys, matched with a contrasting dusky pink that evokes warmth and enjoyment. Reminiscent of a scene from Mad Men, this beautiful space incorporates contrast between the dark timber elements of the home, and the crisp white walls. To infuse a sense of mystery and intrigue, the only elements that are light in colour are the walls, floors and ceiling, which leaves the doors, furniture and all other décor to be a deep and dark brown or charcoal shade. Equally fun and intriguing, this dressing room oozes appeal and interest. 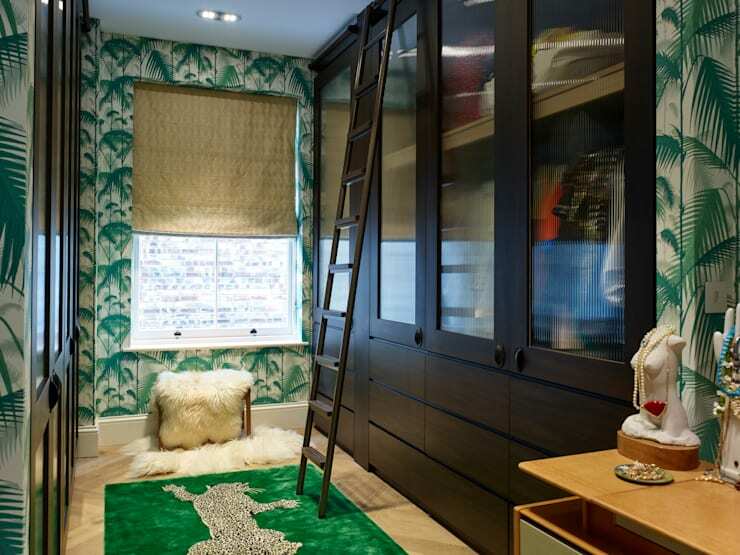 Replete with botanic themed wallpaper, the green tones are followed with a matching jungle print rug also in green, and a light sheepskin covered seat. 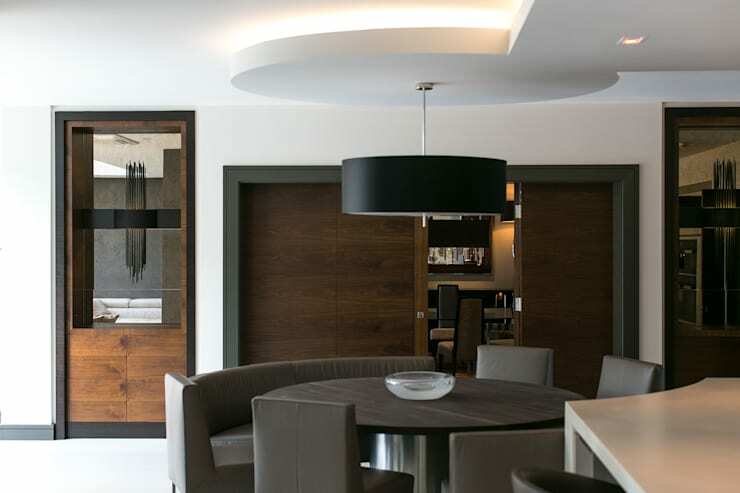 The element which really brings this space together and cements it as a darker and more intriguing interior are the rich timber veneer build in robes. Situated on either side of the room, these imposing yet surprisingly unobtrusive cupboards work wonderfully within the space and effortlessly add a sense of vibrancy and interest to the space. Whether you choose to work at home or not, everybody needs a stylish and captivating home office. This gorgeously decorated British style room evokes a sense of covert and enigmatic style. Perfect for the budding private eye, or MI6 spy, this room abounds in dark tones that exude history and tradition. Reminiscent of something Sherlock Holmes may have enjoyed, this study utilises antique furniture with comfortable textiles and heavy charcoal drapes to create rich ambience and character. Totally contemporary and oozing appeal, this room is a wonderful warehouse conversion that evokes a sense of glamour and industrial pizzazz. 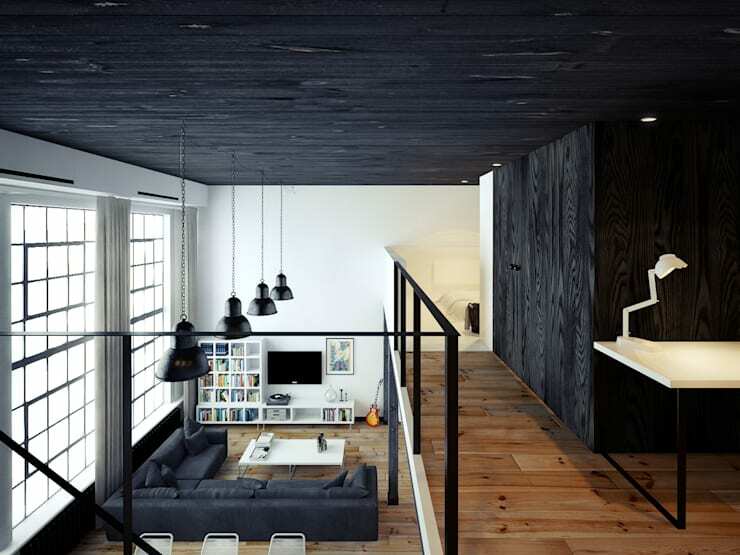 Normally a white ceiling is the traditional way to ensure a space feels open and airy, but in this case the ceilings are so high, they have instead utilised a dark blackened timber which provides warmth to the cavernous space.